Victor Gama is a composer whose process begins with the creation of an entirely new instrument, one whose design is steeped in symbolic meaning. 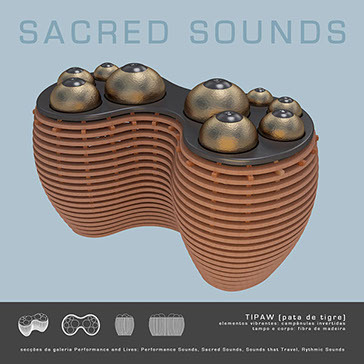 Concept design, the selection of materials, fabrication, and scoring is all part of the rigorous way Gama creates new music for the 21st century, blending current fabrication technologies with ideas, materials, and traditions inspired by the natural world. "The post-digital world has circled back to the object. The same technology that has dematerialized the object is working to rematerialize it,” Gama said in his lecture/demonstration at MIT. "Innovations like 3D printing, digital CAD modeling and Finite Element Analysis have brought the potential to free the instrument from the fixed design paradigm and move beyond pre-sampled digital sound libraries with controller interfaces." Crafted in the digital domain and resulting in a physical instrument. Gama has developed an entirely unique process that generates parameters associated with geometry, design, materials and construction that can be considered additional variables. This results in a physical object that carries a second existence, a shadow of itself that stems from the virtual digital world where it was created, or more precisely, a virtual acoustic instrument. The Toha or Totem Harp, was inspired on the collective nests of the sociable weaver birds that had been extinct from an area of conflict in the south of Angola. It was made specifically to invoke the bird’s spirit and invite him to return. With a top resonator made out of a gourd and a carbon fiber bottom resonator it can be played by two musicians seating face to face. Each musician has a set of 22 strings with the same tuning on each side of the instrument. A curved circular soundboard was recently developed for the toha, a new musical instrument created in 2000 and in constant development since then. Recently Gama developed a digital workshop using a 3D modeling environment based on Rhinoceros and a testing environment using Finite Element Analysis (FEA) using LISA. FEA allows to find resonant frequencies and their harmonics as well as studying several vibrational and tensile characteristics. are four contemporary musical instruments designed and built by the Victor Gama for the National Museum of Scotland in Edinburgh. Each of the four instruments has been developed in dialogue with curators in response to the Jean Jenkins collection of musical instruments based at the museum – looking at issues of construction and sound production – and in keeping with the themes being developed in the Performance and Lives gallery in the new Royal Museum Project. The instruments have been built in accordance with their ability to be played by the public in the resulting display.